Minister of Finance Anas Al-Saleh met on Wednesday with visiting Speaker of the House of the Congress of Paraguay Don Juan Bartolome Ramirez, during which they discussed boosting and improving bilateral relations, as well as finding mechanisms to support bilateral cooperation prospects. 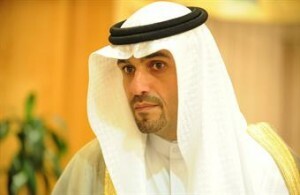 During the meeting, the two sides also agreed to several proposed mechanisms for boosting bilateral relations such as signing an economic and technical cooperation agreement between the two countries, as well as establishing joint committees presided by the finance ministry for the Kuwaiti side, the ministry said in a press statement. Other proposed mechanisms included signing agreements on avoiding double taxation between the two countries, and protecting and encouraging mutual investments in order to develop investment, trade, and economic cooperation between the two countries on the long run, said the statement. For his part, Ramirez said that his country seeks to improve its economic relations with Kuwait in all areas, pointing out the private sector’s important role in consolidating Kuwaiti-Paraguayan ties. He also called on Kuwaitis to invest in his country, particularly in the agricultural and livestock fields as Paraguay has some of the biggest Islamic slaughter houses in the world.